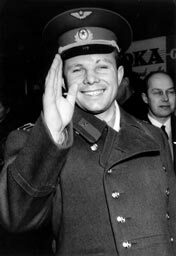 Yuri Alekseyevich Gagarin (Roushie: Ю́рий Алексе́евич Гага́рин; 9 Mairch 1934 – 27 Mairch 1968) wis a Soviet pilot an cosmonaut. He wis the first human tae jurney intae ooter space whan his Vostok spacecraft completit an orbit o the Yird on 12 Apryle 1961. Gagarin becam an internautional celebrity an wis awairdit mony medals an teetles, includin Hero o the Soviet Union, the naition's heichest honour. Vostok 1 merked his anerly spaceflicht, but he served as backup crew tae the Soyuz 1 mission (that endit in a fatal crash). Gagarin later becam depute trainin director o the Cosmonaut Trainin Centre ootside Moscow, that wis later named efter him. Gagarin dee'd in 1968 whan the MiG-15 trainin jet he wis pilotin crashed. The Fédération Aéronautique Internationale awairds the Yuri A. Gagarin Gowd Medal in his honour. This page wis last eeditit on 29 Apryle 2018, at 01:37.